I'd been to Casablanca Cafe last spring and had a great meal and a lot of fun there. So, being in Fort Lauderdale again, we decided to try it a second time. We were not disappointed. It was a very memorable meal. We went on a Sunday Evening in late August, a hot night during the "off" season in Fort Lauderdale. Because of this, we did not have to wait for a table outside on the terrace, right along the sidewalk where we could also people watch. We started out with an appetizer and a soup. For the soup we chose the Gazpacho Frio, a cold tomato-based soup. It had a very fresh tomatoey flavor and was quite good and refreshing. It was pretty much a thin puree, but I could taste the cucumber and onion, among other flavors. Personally, I'd have liked just a bit more heat (spice), but it was pretty darned good as it was. For the appetizer we had Spinach and Ricotta Ravioli. They'd been deep fried and were served on a tomato sauce with romano cheese. They were absolutely excellent. Great flavor--the crispness of the pasta against the creamy goodness of the ricotta and spinach...bathed in the tomato sauce with romano. Each bite was a delight. We easily cleaned up all five of them in short order, savoring each bite. I also had a side salad with my dinner. It was very good, nice tender assorted greens with a house dressing, sort of a citrus based Italian. It was quite good. Our waiter brought us some bread. It was not ordinary bread. It was little bits of heaven. A thin pizza-dough like doughy sort of bread cut in strips and served with an excellent pesto sauce. It was sooo good! For my entree I ordered the Cumin Grilled Flank Steak. It was very good, though I must say I had a hard time tasting the cumin. Nonetheless, it was nicely grilled, a bit charred in places, yet nice and medium rare in others. The polenta cake that came with it was very good and did a good job of soaking up the juice from the steak. The steak was covered with a black bean and corn salsa over some mixed greens. It was all very good. My friend ordered the Peppercorn Dusted Filet Mignon. It was outstanding. Very tender and juicy, it was cooked perfectly. It was server on a shitake-potato couquette that had a nice hint of cheese in it, and a gorgonzola cream sauce that was absolutely wonderful. We had a very excellent meal here, once again. Our total bill (only iced tea to drink) came to about $100 with the generous tip. The food was excellent, though the prices do match. You get what you pay for. But the meal was not the end of the evening. We spent the next several hours at the piano bar with Brian and several other soon to be "friends." Brian is quite good and quite an entertainer. We laughed and sang and danced and had a wonderful time. Next time I'm in Fort Lauderdale, I'm having another Sunday night dinner at Casablanca Cafe, and finishing the evening off again at the piano bar. What a great evening it was. Very good pizza right along Fort Lauderdale Beach. We stopped here for pizza last night, a bit after a fierce thunderstorm had chased everyone off the beach and back to their hotel, guest houses, and homes. It was busy, surprisingly, but the wait was not too bad--if you wanted to eat outside. Well, it was our only choice, and a nice evening, so we did. It was a good choice. Ordering was a bit scattered, the order-taker had a hard time making proper change, and they did forget about my side salad. But the wonderful pizza erased those memories. First the side salad--quite small and just ordinary. But hey, it's a pizza place. It was still good. Now for the good--the pizza. It was very good. We had a half and half--half pepperoni and mushroom, half sausage, mushroom, onion, and tomato. Wonderful from the very good crust to the fresh ingredients. We had the 14" and it was more than we could eat, yet it was hard to stop. While eating, we noticed the continued stream of people in and out, a testament to how good it was. Would I eat pizza here again? You bet, in a minute. I recommend Primanti Brothers. I had heard of La Bamba somewhere, and a friend and I decided to give it a try when we were in Fort Lauderdale. We are glad we did. La Bamba III is a nice place, quite dark inside, but we were greeted warmly and seated promptly. Within second a basket of homemade tortilla chips appeared along with three bowls of salsa, one hot, two mild. First the hot--it was fairly hot and very tasty with a nice on-the-tongue burn--very good salsa. The mild was extremely mild and ordinary, mostly tasting of tomato and cilantro. Probably good for a lot of mild American tastes. A bit of mixing of the two was nice as well. Our waitress brought the drinks promptly and took our order. My friend ordered the Masa de Puerca, a lunch portion. I ordered Enchiladas Verde, a dinner portion. The waitress asked if I wanted the lunch portion, one enchilada. My experience is that normally enchiladas are quite small, so I chose the dinner portion of two. Big mistake. I'll explain in a second. 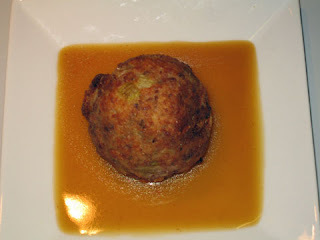 The Masa de Puerca was pork that was deep fried. It was excellent and a huge portion. It was served with black beans and white rice, and plantains. They were all very good. My friend raved about the pork, though, and I tasted it--truly excellent. My enchilada verde arrived. They were huge! Two huge enchiladas covered with verde (tomatillo based sauce). They were filled with huge pieces of tender chicken. The plate also included a mound of yellow rice and refried beans, and was covered in cheese. It was all sooo good. But very filling. I only ate half of it and was stuffed. I should have ordered the lunch portion! The meal, the service, the decor, the ambience, the food, all were very good. I'd eat here again and again if I had the chance and I certainly recommend it highly. Good mexican/spanish food at a decent price. wow! We were in downtown Fort Lauderdale recently, enjoying our walk along the Riverwalk and Las Olas, and stumbled upon Indigo, a very nice restaurant in the Riverside Hotel. Wow, were we glad we stopped in. It was a very hot day out and so we elected to sit inside, but had a nice view of the street. We were not extremely hungry so ordered off the lunch menu. I had the Grilled Chicken with Pesto sandwich with a mixed greens salad. Both were excellent. If any complaint, perhaps a bit too much feta on the sandwich in places. But the sandwich itself was excellent, a few large pieces of chicken, a nice pesto, and beefsteak tomato. It was soooo good and a huge sandwich. I thoroughly enjoyed it. And the price? This was a huge dinner size sandwich at a budget lunch price of $10. Worth every bit of that and more! My friend had the Chicken Parmagiana. It was excellent. A nice cruchy coating topped with a wonderful marinara, some roasted garlic, and tasty cheese. Wow, was it good. It was served with linguini with more wonderful marinara. And a huge portion. Did I mention the price? It was a dinner size portion for a budget lunch price of $9. Not only was the food wonderful and the ambience nice, the waiter was very attentive and the service good and prompt. I'd certainly eat here again and again and again. If lunch is that good, I wonder how great dinner must be. I'd like to go back and try, and next time I'm in Fort Lauderdale, I just may do that! We stopped at the H2O Cafe for a late evening snack the other night be were sorely disappointed. First, the good. Nice atmophere, we sat outside right on the sidewalk and were able to people watch, that was very nice. For an appetizer we had the fish tacos. They were very good, nice and cruchy deep-fried fish, all that a fish taco should be. The accompaniments were a very good pico de gallo--yumm, and a so-so tartar sauce. The tartar sauce tasted very off the shelf, out of the bottle. But it was OK. The real disappointment was the sandwich we had, called a Venetia, Ciabatta Sandwich. The menu made it sound fantastic: prosciutto, salami, ham, roasted red peppers, caramelized onions, lettuce, tomato and olive oil. But the reality was that it tasted like an ordinary ham sandwich--I could not taste the salami or prosciutto. I've had better ham sandwiches from a vending machine at a fraction of the cost--this one was $12.95! So it was a very uneven experience here, but mostly just blah. The food was not bad, but overpriced for what it was. I probably would not go back and certainly would not recommend it to anyone unless you only wanted a few drinks, the atmosphere--sitting outside and people watching--was good. I never have had a bad meal or less than very good experience at Caffe Positano in Lake Mary, and last night was no exception. My only complaint at all is that when you go to their web site, it plays music automatically--I am not a fan of web sites that do that. Anyway, once again we had a great experience there. We were warmly greeted and seated immediately. Our server, Luz, was very attentive and helpful, explaining the specials and answering all our questions. We've had her as a waitress before--she's the best! For an appetizer we had Shrimp Buona Sera, shrimp with butter, garlic, parsley, and provolone. It was good though the shrimp a bit on the small side and a bit hard to find swimming in the butter and covered with cheese. Still it was quite tasty and the shrimp, while not perfect, were well done but not rubbery. For my main dish I ordered a special which was tender chicken breast covered with cheese, roasted red peppers, sun-dried tomatoes, and a few other tasty things. Let me just say, it was delicious. The chicken was very tender and the whole meal just fabulous. I started off with side salad with a homemade Italian dressing, also very good. My friend had the Baked Fettucine Roberto, baked chicken, veggies, tomato sauce, light cream, and mozzarella. Though the amount of chicken seemed to be rather slight, it was still a very good dish and quite tasty. Total damages for our meal (not including a generous tip) including wine, appetizer and main dishes was about $60. Not cheap, but a very good meal. You get what you pay for! We had another great experience here at Caffe Positano and will come back again and again and again. One of two very good Italian restaurants in Lake Mary, I highly recommend it! My friend and I went out to eat the other night at Red Lobster in Daytona Beach. It was, as is usually the case at Red Lobster, a pleasant experience with good food. Not great, mind you, but definitely good. We started with some seafood stuffed mushrooms. They were plenty good though the mushrooms on th small side. But still quite tasty. For the price, I'd have liked slightly bigger 'shrooms. For my dinner I had a combination of salmon and shrimp with a buttery, creamy, lemony sauce. It was delicious, though the shrimp were, as is usual, just bit overcooked--I always try the shrimp first thing as they tend to continue cooking on the plate. But other than that, it was a very good meal. Fortunately, the shrimp were not terribly overcooked either. They were not rubbery, they were tasty, just not perfect. On the other hand, the salmon was very close to perfect. Still moist and juicy, tender and flaky, and not dried out at all. It was delicious. My dinner came with broccoli and i had more broccoli as a side. I love broccoli with some lemon on it, and it was cooked just right. A fairly healthy dinner (if you take away the sauce and the luscious garlic-parmesan rolls!). My friend had a combination plate that was equally good. Scallops, shrimp, and chicken. All were tender and flavorful. The parmesan mashed potatoes had a nice flavor as well. All in all it was another good meal at Red Lobster for a reasonable price. I had lunch the other day with a few coworkers at Chili's Grill & Bar in Lake Mary. It was OK, but just OK. I've eaten at Chili's a number of times and it's OK for what it is, mass-produced food that's moderately tasty but not always all that healthy to eat. Wanting to be a bit healthy, I had half a Smoked Turkey sandwich and a side salad. The salad was OK, not very big, but pretty typical for chain restaurant fare. But the turkey sandwich, I'll tell you, looked absolutely nothing like the picture on the web site. It was a fair portion of turkey and that part was good. But the bread was very boring and a bit on the stale and dry side. It was not very good at all. The Chili's menu on the web claims the sandwich is :Sliced hickory smoked turkey, Swiss cheese, mayo, lettuce & tomato on a toasted chile-pepper sandwich roll." But mine was only served on a very plain white bun. Very disappointing, but it was lunch, I was with others with limited time, and just ate it. The fries, by the way, were somewhat lifeless and boring as well, I think they'd sat just a bit too long and were certainly not fresh out of the fryer--the first thing I tried was a fry. Oh well. I have been to That Deli! here in Lake Mary about 4 times now and every time I am very impressed. Went there for lunch with my boss yesterday. Told him we had to go by 11:30 to avoid the lunch rush and I was right. By the time we left, every available inside seat was taken and some people were sitting outside. There were a number of takeout orders and at one point the line was out the door (but moved fast). What does that tell you? It tells me they are very popular for a place that's been open barely half a year. I found this place by accident but I keep going back and keep talking about it. It's one of my two favorite lunch spots in Lake Mary--or anywhere in central Florida for that matter! I had a two daily specials for my meal--the Blue Meaning sandwich and a potato salad side (and the total with drink was about $10--a good deal!). The Blue Meanie was hot turkey, bacon, blue cheese crumbles and tomato. It was very good. The salad was red potato with thousand island dressing, green peas, and red peppers. It was also quite good. I've never had a bad meal here. Several weeks ago for a company paid celebration, we ordered 10 to-go meals from here. They had them ready at the appointed time and everyone really liked the food. I'll be back here again and again, I'm sure. I love this place! It is worth it to drive from the Lake Mary/Orlando/Sanford area to Titusville just to eat at Dixie Crossroads. But if you do, you must order the Rock Shrimp. They truly Rock! Rock shrimp are a hard-shell shrimp that are split in half. You just peel the shrimp off the shell, dip in butter, and you'd swear you're eating the tastiest bit of lobster ever. Yes, they are that good. When you sit down, they bring you a bowl of corn fritters topped with powdered sugar. They are delicious be beware, you do not want to fill up on these alone. We had an appetizer of rock shrimp. Later on my friend said that if he'd know the rock shrimp were that great, he'd just have ordered a big ole basket of them for dinner. As it was, we both had mahi-mahi. He had his fried and said it was very good. I had mine blackened and it was good, though I'd say just a tad overcooked. Still it was good. Along with a side salad and a tasty and not overdressed coleslaw, this was a very good meal. It's a special treat to go to Dixie Crossroads for a meal. I suggest it's worth the trip. Caution: I've been here before and had to wait a long time--it is just that good and it is worth the wait! A friend and I had dinner at the Monterey Grill in Port Orange (south of Daytona) last Saturday evening. We'd been here once before and raved about their Firecracker Shrimp appetizer, so were anxious to see if we could have a repeat outstanding performance. The Firecracker shrimp were outstanding, cooked just right and excellent in every regard. The breading was crisp and firm, not at all greasy, and the sauce give it a nice littl kick. I could probably eat a whole bowl of these lucious little lumps of goodness. Yumm. I had a bowl of Chicken Artichoke soup, just because the combination sounded intriguing. 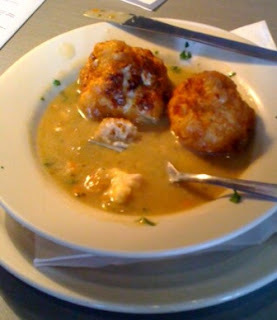 The chicken was tender and juicy, the broth creamy, and the big chunks or artichoke delicious. A very good soup. For dinner I had the Laguna Beach Fried Shrimp. The shrimp were battered and deep fried, cooked perfectly. Yumm. The only off-key was the cocktail sauce--it was a bit bland and lacking in the horseradish kick I usually find in a good cocktail sauce. It was just OK. The mixed farmer's market veggies I had to go-with, and the salad, were both very good. My friend had the Monterey Chicken which was also very good. We had a great and satisfying meal here. The service was attentive. The place was busy and we had a short wait, a testatment to its popularity and its good food. We'll be back here again, no doubt! I decided that I could imitate the great deep fried turkey dinner with beer gravy that I had at the Comet Cafe in Milwaukee recently. I was successful with my experiment. First I made turkey dressing using my famous secret recipe. I made it very simple: sausage, onion, celery, hearty white bread that I'd toasted, and chicken broth. Of course sage and a dash of cayenne and a few other seasonings. I baked it in the oven till well set. Next was the turkey. Well, poultry, at least. I chose bone in chicken breast halves. I brined them for an hour, then baked for about 45 minutes just till done, then let them cool. Next the gravy: I used butter plus a little bit of bacon grease and a little bit of chicken fat. I browned carrots, onions, and celery, then deglazed with just a bit of white wine and some O'Doul's beer (alcohol free). Added cake flour to make a roux, then chicken broth (part homemade) and beer and made a savory gravy. Used thyme as the primary herb for its seasoning, with just a bit of sage. I tried a few "dressing on a stick" a la Paula Deen--they were OK. But then I took some of the chicken in 1/2 to 3/4 inch cubes, added it to the dressing, and formed into balls. They were the best. The coating and deep frying gave it a nice crunchy exterior and the beer gravy was absolutely to die for. 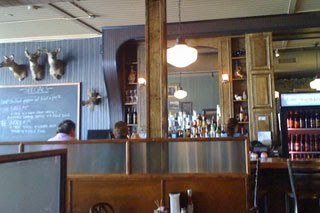 The bayview area of Milwakee is home to Honeypie, a quaint bar/restaurant/cafe on South Kinnikinnic Avenue. It was a great find! I went there for lunch yesterday with my sister and her husband, the perfect end to my Wisconsin vacation. I had a lunch that was as delicious as it was memorable for the good food. My only regret is that I had to leave town and can't go right back for dinner. I had the Porkslaw, a pulled pork sandwich topped with celery root slaw and servd on an egg bun. The sandwich itself was huge, the portion of pulled pork gigantic. The pulled pork was expertly done, tender, juicy, and with a nice barbecue sauce--not to sweet, not too sour, just the way I like it. The celery root slaw itself was outstanding. It had a nice woodsy flavor and was crisp enough to stand up to the hot pulled pork. Eating this sandwich was no easy feat, it was that big. But procuring a stack of napkins, I attempted it. Mmmmm--what a great taste it was. To go along with it I had a side salad with a wonderful basil viniagrette dressing. My sister and brother-in-law both had the fries with their meals. My sister proclaimed the the "best ever" fries! And I'd have to agree, they were outstanding. She also had a slice of the key lime pie, equally good. For a small place in the south side of Milwaukee, Honeypie delivers "big place" taste, based on my experience. Next time I'm in Milwaukee I'll be wanting to go here. In the meantime, I suggest you try it. They have a number of items on their menu that look simply outstanding. Give 'em a try! Can you get real, Chicago-style deep-dish pizza outside of Chicago? The answer is yes! Edwardo's Natural Pizza in Milwaukee is part of a small Chicago-based chain, but they show that they do know how to make authentic Chicago-style deep-dish pizza. I was visiting family in Milwaukee and when they mentioned the Sunday Family Special at Edwardo's, I was all ears. For about $16 we got a medium deep-dish classic (tomatoes and cheese) Chicago-style pizza and a pitcher of diet Coke. The four of us ate to our fill and still there was a slice left. What a bargain. But on top of that, the pizza was absolutely delicious. The creamy, oozy mozzarella cheese on the bottom over the delicious crust, and topped with a savory tomato sauce with a hint of basil and oregano--what a great combination. And a great price. The menu is pretty extensive and they have both deep dish and thin crust pizzas, some very trendy (Chipotle Chicken), others traditional, beside some other traditional Italian offering. Sure wish we had one of these in Central Florida. If you're in Milwaukee or Chicago area, be sure to look them up. Wonderful pizza. Yumm! When I go to visit family in Marshfield, WI, a stop at The Kitchen Table for breakfast or lunch is almost always a necessity. By the way, I have previously reviewed this restaurant on urbanspoon.com. The Kitchen Table is uniquie with it's home baked breads and pies, its community (i.e. kitchen table) seating, and it made from scratch food. Always a good meal here. 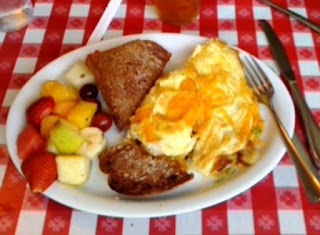 This morning I had the peasant omelet: potatoes, bacon, green onions, and cheese in a three egg omelet with a wonderful whole wheat toast (real whole wheat toast, not the "lite" version you get most places) and some fruit. Once again, the meal was wonderful and quite a value as well. If you get to Marshfield, make sure you look it up and give it a try sometime. You will not be disappointed! My brother raised the chickens we had. Talk about plump and flavorful! My Dad's garden provided the red potatoes, white potatoes, cucumbers, green beans, and yellow beans, and raspberries. My Dad grilled the chicken. My Mom cooked the rest of the meal and marinated the chicken. The whole-grain bread was home-baked by a local small bakery. Now I tell you, it does not get any better than this! I am vacationing this week in central Wisconsin, visiting family, and this was about the best meal a person could ever have. The chicken was flavorful, juicy, cooked perfectly, and quite plump. You so not see chicken pieces with this much meat and this little fat in your supermarket. It was divine. The yellow and green beans has some bacon bits and a hint of red wine vinegar--they were to die for. The potatoes were a flavorful medley of newly dug white and red potatoes, with some sweet potatoes thrown in for extra sweetness as well as color. Absolutely delicious. The cucumbers were fresh from the garden, mixed with a little green pepper and sour cream. I'm not a big cucumber fan, but I had seconds of these (and, I'll guiltily admit, everything else as well). The whole grain bread was hearty and flavorful without being bready. To top off a most wonderful meal, a homemade layered dessert featuring--you guessed it--home-grown raspberries fresh from the garden. If two words could sum up this feast, they'd be "home-made" and "home-grown." Truly a meal to die for! Thanks, Mom and Dad! I had lunch at The Comet on Milwaukee's lower east side today, and it was excellent. I had first heard of The Comet on a Food Network show, Diners, Drive-Ins, and Dives. Having been raised in the Milwaukee area and having lived on the lower east side when I was younger, my interest was piqued. So when visiting in town and my sister asked where I wanted to go for lunch, I immediately suggested this place. We were not disappointed. I started with a bowl of Tomato soup. It was rich and creamy with a very nice, clean tomato flavor. Next I had a side salad with ginger dressing. Yumm. But the star was my entree, AJ's Compact Turkey Dinner--three battered and deep fried balls of turkey, dressing, and mashed potatoes, covered in gravy. It was to die for. What a fantastic concept. I'd like to reproduce this at home. I'd certainly come back to eat it again--though the menu was chock-full of things that sounded very tasty. And nothing on the menu was more than $10. My sister had the fish and chips and pronounced it a success as well. The Comet is a restaurant by day and apparently a bar or local hangout by night, serving a nice assortment of bottled beers, and some on tap, as well as wine and a full bar. It was a pleasant place and quite busy when we arrived right at noon. Milwaukee, you have a little gem here, I hope you appreciate it. I know I sure did. Total bill was about $27, not bad for a great meal. Definitely good eats! It's not all about eating out, but about food, and I love to cook besides eating out. Last night I cooked. Last night I made some delicious pulled pork quesadillas for dinner. I'd smoked several pork butts (shoulders) about a month ago and frozen some packages of the meat for just such an occasion. The meat was slow cooked all day in hickory smoke and had a nice smoke ring and a great smoky flavor. I'd also made several varieties of barbecue sauces and saved them, too, for another time. For the quesadillas, I added small amounts of three different barbecue sauces--two were my home made sauces, one was store-bought. The latter was Bulls-Eye brand, a frequent winner of taste testings. For me it's a bit on the sweet side, but has a nice flavor. To that I added a Tomato-Vodka sauce of my own that had quite a kick to it thanks to cayenne. And for a bit more mellow flavor, i added a vinegary tomato and onion based sauce. The combination of the three gave me the flavor I desired--smoky, sweet, acid, and heat. Yumm. I added the sauce to the pulled pork and arranged this on a honey wheat (low-fat) tortilla. Then I diced a few shallots and added them, and finally a layer of cheddar and monterey jack cheese. A few minutes later--thanks to my Quesadilla making machine--I had a wonderful quesadilla, expertly cooked. And the flavors? Oh, it was wonderful. I served with just a bit of BBQ sauce on the top and a dollop of sour cream. A wonderful creation that I'll surely make again. Definitely good eats in central Florida at my house last night! Had a nice meal at Liam Fitzpatrick's in Lake Mary last night with a friend. We'd been here once before for a drink and an appetizer, so decided to try a full meal. We were not disappointed. We started with the Crab Stuffed Mushrooms and they were wonderful, served with an outstanding horseradish and stone ground mustard sauce. There was no "bready" taste or consistency so often found in a dish of this type. The stuffing was excellent in every way, and the presentation on shredded lettuce with a dusting of shredded parmesan was grand. We were both disappointed when all five of them were gone. My side salad was good, though a bit on the small side for $2.95, the portion disappointing. My friend had the baked potato soup, it was wonderful. The potatoes were well cooked but not mushy. Yumm! For my entree I had the Chipotle Chicken Flatbread. The smooth and creamy texture of the goat cheeese somewhat tried to overwhelm this dish, but the nice heat of the chipotle and the crispy flatbread tamed it a bit. Add the sweetness of the caramelized onions and the roasted peppers along with the chicken, and I loved this dish--and the portion was nice--not too much. My friend had the St. James Irish Steak Stew. Sirloin tips in a rich stew served in a bread bowl. This had the flavor of a long-simmered stew. The meat was cooked perfectly, the vegetables soft and "beefy" in flavor. A hint of wine. This was a wonderful dish. The side of mixed seasonal veggies seemed more like an afterthought and was not really notable. This was a good meal and the service provided by Max was attentive. But I did have one complaint.... We sat by the window and were able to watch the comings and goings outside in this nice setting, but the windows were dirty on the outside! Yuck! Please, clean your windows. I'm sure it's hard to maintain, but it's the little things that could have taken this good dining experience and made it truly great! Total damages including a beer and an iced tea came to $48.75 plus tax and a generous tip!